Posted by Ryan Jerz on Sunday November 5, 2006. The Pack is making me happy right now. In fact, they’re looking so good you’ll have a very hard time telling me that they won’t have a very good shot at upsetting Boise State on Thanksgiving weekend. Tonight’s 45-7 shellacking of Idaho was impressive not just because they went on the road and won large, but because they won large however they damn well pleased. Whether it was Rowe completing passes at will or Lippincott running up the middle, they manhandled the Vandals – a team that gave Boise a run for its money. All of this is setting up perfectly. The Pack gets hapless Utah State (a team I have a personal connection to) at home next weekend and Louisiana Tech on the road the next. Boise gets San Jose State and Utah State in the next two weeks. For both teams, wins will be expected in all games. Then, we get the holiday. By most accounts, it looks like the game will be moved to Friday night to accommodate ESPN. Cool with me. I like the lights. I like the cold. 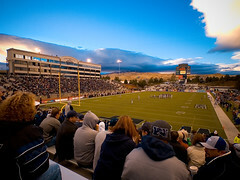 And I love the idea of the Pack playing at home, on TV, and in a game that has BCS implications. With a win and an undefeated season, Boise will get itself in the BCS. And they’d deserve it. But if the Pack can knock them off, the whole country will see Nevada as an upstart national player who can hang. It would also set the table for a big year next season and not allow the team to let down like they did this season against ASU. It’d be time for Nevada to show up on the national scene for real. Jeff Rowe is a major key for Nevada in the next two weeks. He has to be healthy. Despite Travis Moore looking good in his starts and other appearances (and also despite my Travis Moore fanclub readers), Rowe is the best guy Nevada has at the QB position. He’s faster, better at making decisions, and stronger. He’s also beaten a Fresno team in a similar situation last year. He has to start and play through this game. The running game is of no concern offensively. The Pack is showing that they can plug any of their backs in at any time and have success. Robert Hubbard will be fine. Lippincott looks really good. I’d love to see that guy about 20 pounds heavier. He’d be a beast. Brandon Fragger is already a beast, but his health is currently a concern. In two weeks he could be ready to hurt fools, though. Even Mike Kanellis was outstanding tonight. I doubt we’ll see him outside of another mop-up situation, but it’s nice to know that four guys can look pretty good running the ball. The defense seems to be finding it’s fury. They are awesome right now. I think they can contain Boise and keep the offense in the game. If the defense continues to play like they have the past several weeks, it’ll be a long, cold night in Northern Nevada for the Broncos. That’s how I’m seeing it. Let’s just hope Boise can take care of business in the next two weeks. I know the Pack will. So don’t let us down Broncos. We need an undefeated team in here so the Pack can make a name for itself in front of the entire nation. I’m counting on you.